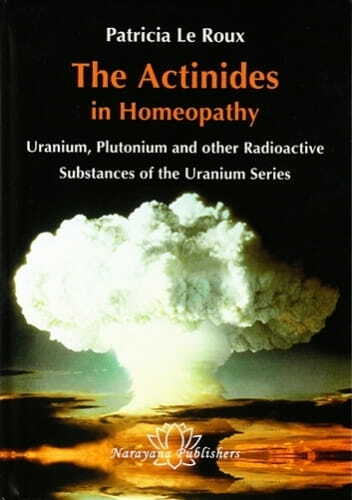 The well-known pediatrician Patricia Le Roux has again written a groundbreaking work describing the use of actinides in homeopathy. Up to now, there is very little known of the remedies of the seventh series (Uranium series). Patricia Le Roux describes the main themes of those remedies especially in children giving many illustrating cases from her practice. The chief subject of the seventh series is a person's fluctuation between a very strong potential energy and a simultaneously threatening disintegration, which is suddenly triggered by an event. This event sometimes occurred very early in life, often in childhood or even as early as the pregnancy, in the family history or in history as a whole, such as a volcanic eruption, an earthquake, or the explosion of a nuclear bomb. Actinides can be prescribed if the life history of the patient has been influenced by a great historic shock such as Hiroshima, Chernobyl or Fukushima, or a nuclear test explosion. On the psychological level, these people have very well-developed powers of intuition, and the prescription of an actinide can truly work wonders by improving an often very critical condition. In pediatrics, actinides are often very helpful in severe pathologies that might otherwise lead to disability. Most elements of this series are highly radioactive, meaning that they emit radiation which then rapidly and systematically declines in intensity. This is the reason why patients who need these remedies in fact possess enormous potential energy but are constantly in danger of losing it. Such patients are often ahead of their age. They are seeking a state that is far in advance of their physical development. These people have a very mature worldview and are wise beyond their years. Their mental maturity is certainly greater than their physical maturity. They display severe pathologies such as bone-marrow diseases, blood diseases, cancer, congenital deformations, accidents, and so on. We frequently find ourselves dealing here with patients threatened by decay, dissolution, and death. Each element is described fully, both chemically and conceptually. Le Roux generally limits the analysis to Scholten and also draws heavily on the work of M. Plouvier-Suijs. I found this a little frustrating as some work was not included as much as it should be. Jeremy Sherr's Plutonium proving was mentioned only as a footnote, although his, as yet unpublished, Americium proving is mentioned in the introduction to that element. To concentrate on the positives of the book, I liked the logical way Le Roux presents each element and then provides a case. She explains clearly what her reasoning is at each stage and gives follow ups. In some respects I found it too mechanical, as a lot of the information is supposition based on the periodic table and hence some extrapolation takes place. For some homeopaths this is a leap of faith too far as only proving evidence is acceptable to them. However given that there are elements which cannot even exist for more than a fraction of a second, this is no surprise! The book is divided into three themes. The first part gives an excellent overview of the Actinides and the Uranium series. Le Roux describes the Actinides as "patients who are... searching for healing in the farthest reaches of their disintegrated or extremely weakened being". This fits well with the theme of the Uranium series and is elaborated in the book. Then the elements from Francium to Californium are discussed, some with long history in homeopathy, eg Uranium and Radium. Some, like Plutonium and Neptunium have some provings and these are usually the nitricum and muriaticum salts. The third part looks at the trans-Californium elements and is purely supposition, based on the Scholten method. Interestingly though, if we consider Le Roux's description of the Actinides, even these elements bear conceptual examination. There was after all a time when some of these elements now being proved, did not "exist" or occur naturally. The great strength of this book is its practical feel. I recently reviewed a book by Didier Grandgeorge, The Homeopathy Handbook for Children, who was Patricia's teacher. I have the same regard for this work as I did for the earlier book. It may be that both are paediatricians and the homeopathic treatment of children lends itself to clarity.